The bow was an important tool and weapon for the hunting in ancient <?xml:namespace prefix = st1 ns = "urn:schemas-microsoft-com:office:smarttags" />Mongolia. It is now used for sport. 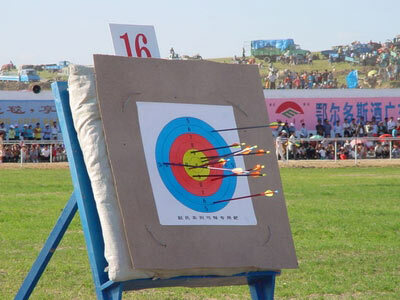 Archery is one of the major event of the "Nadamu." Archery not only improves physical strength, but strengthens calmness and decisiveness. 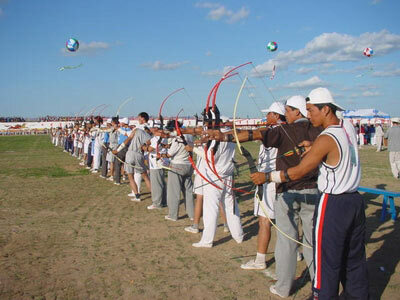 Mongolian archery is divided into archery on foot and archery on horseback. Each participant can fire nine arrows in three rounds, those who hit the most targets will be the winner. The archers wear colorful robes and riding boots during the contest. Archery on foot: All archers make preparations and fire at the bull's eye at the same time. If the bull's eye is hit, it will falloff and the audience will applaud. The prize will be awarded to the archers by the organizing committee at the end of the contest. Archery on horseback: The participants are archers and riders at the same time. Each participant is allowed to take only 23 arrows. Each one can fire altogether nine arrows in three rounds. The arrows and horses are provided by the participants. The run is 4m in width and 85 m in length. Three targets will be set and the space between targets shall be 25 m. At the time of competition, the archers draw arrows from their bag and the award will be granted according to the number of arrows that hit the target. After the founding of the People's Republic of China, steel arrows, plastic arrows, nylon arrows and metal arrows were gradually introduced. Archery experienced vigorous development. The Inner Mongolian shooting team has obtained numerous honors in domestic and foreign contests.